When your little one loves to be wrapped up, this huge Toddler Blanket fits the bill. At nearly 5 feet x 5 feet, it is ideal for home, daycare usage and nap-times. 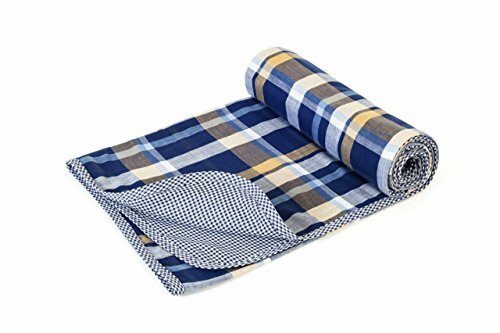 Included in this debut collection from Henry and Bros. is one toddler blanket made from two layers of the classic Henry and Bros. blankets. This soft, pre-washed cotton blanket is generously-sized (57" X 57") to provide lasting comfort and moderate warmth which your toddler will love as they out-grow the baby blankets. The beautiful pattern has been designed in a classic, striking pattern for long-term appreciation and daily use. Ideal for warmer climates and seasons and of use in a wide array of activities. Each layer of fabric is made from a unique double-layer cloth cotton design, the blanket has a three-dimensional structure which allows air to flow through an inner chamber of the two blanket sides, thus providing a lofty feel to this light layer as opposed to a two-dimensional flat sheet. This same fabric structure enables breath-ability for babies, quick drying, and light-weight pack-ability. The founder of Henry and Bros. is an American mother of three small boys with a PhD in textiles who designs and manufactures all Henry and Bros. products. The packaging has been kept minimal for cost and environmental savings, while the quality and detail has been applied to the garment and fabric. Made for my growing kids and yours! COZY KIDS BLANKET, EXTRA LARGE WOVEN TODDLER BLANKET, DOUBLED LAYERED FOR WARMTH, INCREDIBLY SOFT WITH FINE THREAD AND PREMIUM QUALITY - Stitched by hand, supremely soft and wonderfully designed, this blanket throws for kids adds cozy style to your child's sleep space. This kid blanket is woven of cotton percale, it's noticeably denser than other cotton fabrics and wears well over time, tailored, relaxed and timelessly styled. SNUGGIE BLANKET FOR KIDS MADE OUT OF 100% COTTON, COOL COMFORT AWAITS YOUR LITTLE ONE WITH THIS STRIPE COMFORTER - The kids throw blanket has horizontal stripes and comes in fun patterns & unique different designs which giving it a crisp, clean look. These kid quilts would look perfect in a nautical themed bedroom for a girl or a boy. Our signature kids cotton blanket provides their sleep/play space with the gentle feel and cozy warmth of pure cotton and the luxurious look. FANTASTIC KIDS QUILT, IDEAL FOR YOUNG CHILDREN, 2 LAYERS OF PREMIUM SOFT COTTON FOR A CUDDLY & COMFORTABLE BLANKIE - Kids blankets and throws that are ahead of their time, these fun quilts for kids are just the right choice for your growing child. Henry and Bros. uses high quality cottons and soft materials to keep your little one safe, happy and comfortable. Not only will your little one love bed time, but their nap-time will be out of this world! CAN BE USED AS A TRAVEL BLANKET FOR KIDS/SCHOOL NAP MAT/NAP MATS FOR PRESCHOOL; SMOOTH, FINE FABRIC & FINISH, NO COARSE FEEL OR STIFFNESS - These soft blankets for kids are super comfortable and feel lovely on their skin, absorbent and fast drying. An easy usage toddlers blanket which provide the perfect snuggly comfort for your kids, softness for sleeping, and light character for easy line-drying and frequent washing. This quilt is made out of natural fibers and perfect for moderate seasons. KIDS BEDS BLANKETS, LARGE & GENEROUS FOR GROWING KIDS AT 57'' X 57'' AND HEMMED, BLANKET TOP & BOTTOM LAYERS WITH LIGHT POLY FILLING - Wrap your kid in stylish comfort with our ultra-cozy blanket. Layered for warmth in 100% breathable cotton, this blanket features contemporary prints that will complement your entire kids' wardrobe. Elevate their sleep space with this fine look. If you have any questions about this product by Henry And Bros., contact us by completing and submitting the form below. If you are looking for a specif part number, please include it with your message.